Grow as a perennial and grow grafts from root parts of and adult plant. Pick the flowers before they bloom fully, as they use a lot of nutrients. Transplant to another place after 10 years, when it is already ages and will decay quicker in worse conditions. One plant needs at least 1 m2 (approx. 10 ft2). Sunny or half-shaded. Half-shade is better. One plant per family is enough. Before transplanting, fertilize the soil well with barn manure. Cover the soil around with home compost in winter and water with nettle brew a few times in summer. Once a week and very deep in drought. Otherwise it is not needed. Spinach, brassica vegetables, onion, garlic, roses. It is not a demanding plant, but keep the soil soft and prevent water stagnation around roots. Cut the stems till mid-July, as they contain too much of oxalic acid later. Don’t cut off the leaves, but tear them off. Use the stems to add to compotes, juices, jams and pastry, or make soups and risotto with them. You can prepare the still closed bloom sprouts like broccoli. Rhubarb contains a lot of ballast substances, vitamins and minerals. But don’t use the leaves due to the oxalic acid. Rhubarb is not recommended during pregnancy and breastfeeding, for people with prostate problems, hemorrhoids, urinary problems, gallstones, kidney stones, arthritis or gout. It needs soft and moist soil and a lot of space. It grows well in half-shade. The soil around it should be always covered with mulch. Many people are allergic to rhubarb leaves, so it’s better to use gloves when working with it. It originates in the East Asia. Its leaves are a good compost material. 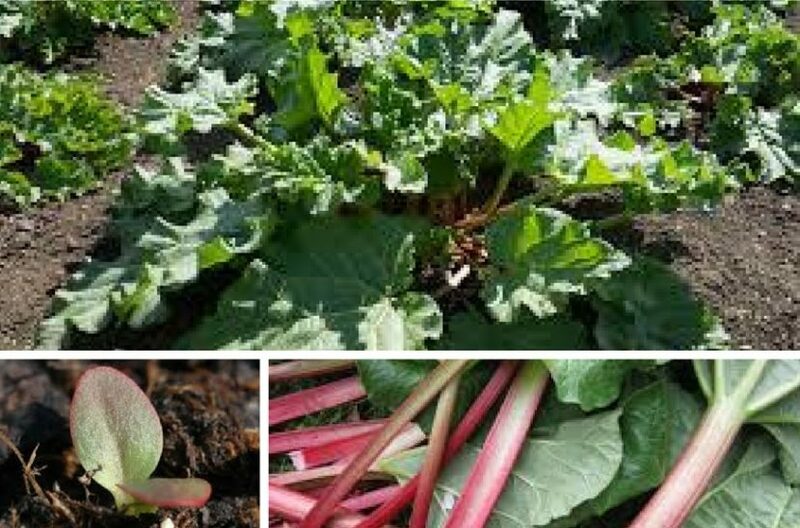 You can use rhubarb leaves tea to water the soil before planting brassica vegetables, to prevent clubroot.